The Vulcan, the second of the three V bombers built to guard the UK during the Cold War has become an aviation icon like the Spitfire. Its delta shape is instantly recognisable as is the howling noise it makes when the engines are opened for take-off. Vulcan Boys is the first Vulcan book recounted completely first hand by the operators themselves. It tells the story of the aircraft from its design conception through the Cold War when it undertook its most important job as Britain’s nuclear deterrent; before unbelievably, at the end of its service life, also playing a significant role, with its bombs and missiles, in liberating the Falkland Islands for which it gained much celebrity. The individual accounts from a variety of contributors detail how hours at a time were spent on readiness, waiting to be scrambled to defend Britain in the event of a third world war. In addition, they show how their aggressive skills were honed by carrying out Lone Ranger sorties flying to the States and westward around the world, and by taking part in Giant Voice and Red Flag, competitive exercises against the United States Strategic Air Command. The attacks in the Falklands using Shrike missiles are described accurately and in great detail for the first time including the landing at Rio de Janeiro alongside a vivid account of the Black Buck 2 operation. 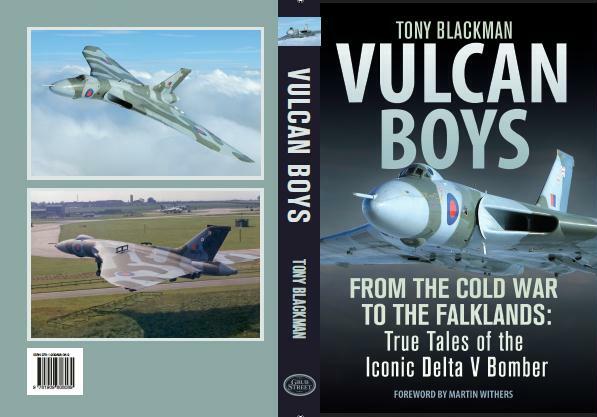 Tony Blackman has made Vulcan Boys a fascinating and completely authentic read reminding us of the Cold War, how it was fought and the considerable effort required to prevent all-out nuclear war.